Like every year, Kim Jung Gi will be present in Angoulême for the Festival from January 24th to January 27th. He will be there every day to sign his Sketchbook 2018, as well as of course the rest of his sketchbooks. You can find him, along with Editions Caurette, in the “Bulle Manga”. Come and say hi! We'll keep you updated with more information as the date draws closer! After attending THU, Kim Jung Gi flew to New York to attend the NYC Comic Con, which took place from October 4th to October 7th. He also took the time to sign books. Here are some pictures of the events! He spend some time in Steve Aoki's booth at the Comic Con, and held a signing event in a library with Hans Olo. From September 24th to September 29th, Kim Jung Gi will be at the THU in Malta. If you don't know what THU is, well it's a platform for artists and creators of the digital entertainment. The event lasts for 6 days, and has been taking place every year since 2013: this year is the first time it takes place in Malta! 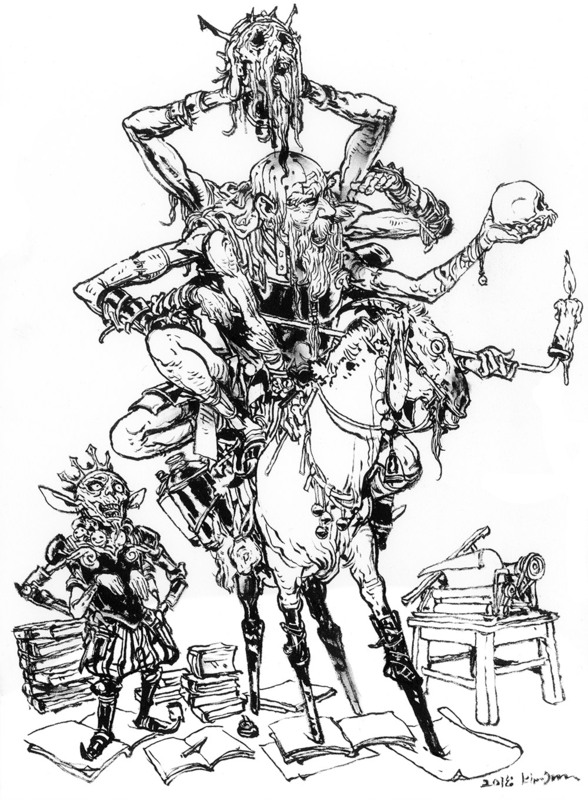 For its 6th edition, Kim Jung Gi is the one who designed the poster. If you are curious about THU, feel free to check out their Website! To celebrate the publication of Tegn - book two in June, Kim Jung Gi is glad to present us with his breathtaking guest-art ! You can see him draw it live underneath, or on his Facebook page. Created by Even Mehl Amundsen in 366 days, Tegn is a serie of three books, gathering 366 sketches telling 366 stories. Launched on kickstarter in 2017, Tegn - book one encountered an incredible success. You can pre-order Tegn - book two already on LiberDistri. Good afternoon everyone ! We are currently waiting for a delivery from Korea, but the boat takes more time to arrive than we expected...! As a matter of fact, we will receive them next week. We will do our best to ship them as fast as possible. Except for France, we cannot guarantee that you will receive it before Christmas, and we do apologies. We wish you nice holidays to come :) The European KIM Jung Gi team.